Do you want to find the name of a song which you haven’t heard before? Then, Here I have the guide for you. We all have faced this once in our life that you visit somewhere and you listened to some new music which forced you to hear again. But for some reasons you failed to remember the lyrics still the background music is floating around your brain. What can you do with the background music? Where do you search? Is it possible to search background music on Google and Bing? Unless or until you have lyrics you can’t search anywhere. So, To aware of these problems in our daily life. I have got the solution for you. Note: – All Apps given below are available in Play Store to download. Also, The Image Credits goes to Play Store. 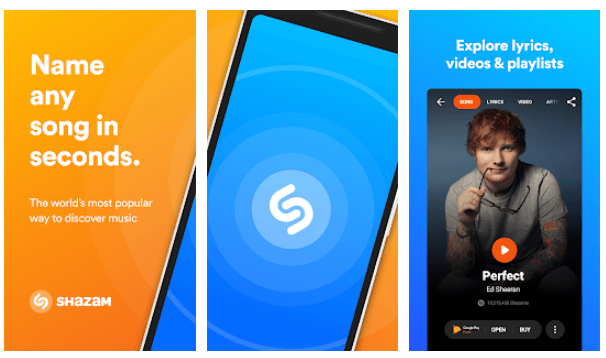 Shazam is the well-known popular application which is supported by almost all the platforms like Android, Windows Phone OS, Blackberry and even available for iOS. It is the fully featured music app which allows you to follow your favorite artist and allows you to see what you’re friends are listening to. Also, Once it finishes identifying it provides the link to play and details of the entire song. Directly, Install the Shazam app and once you’re done with the installation. Open it, and You could be able to see the big button. Hold the button and take your phone near to the music to identify the song name. Also, The Shazam app needs to be connected to the internet to recognize or else it will record the music and searches back later. But, You can search 4-5 tracks per day as it is in a free version. Also, The app contains Ads. If you want to get rid of it, You can upgrade your account to the premium (Paid version) where it allows you to search unlimited tracks and you will get an Ad-free interface. The Paid version costs $4.99. It is yet another great app to recognize music around you from your Android device. This app is available for free in the Play Store, and It provides an Ad-free interface which is excellent in terms of service. Also, MusicID will show the songs related to your favorite artist. If you want to hear other songs played by your favorite artist then, This app would work great for you. But, MusicID will work a bit slower than the Shazam. Apart from that, Everything seems to be awful. It will suggest music related to your favorite artist. It will show the movie information and biographical data about the artist. You can add a note from WHERE and WHY you listened to the song. 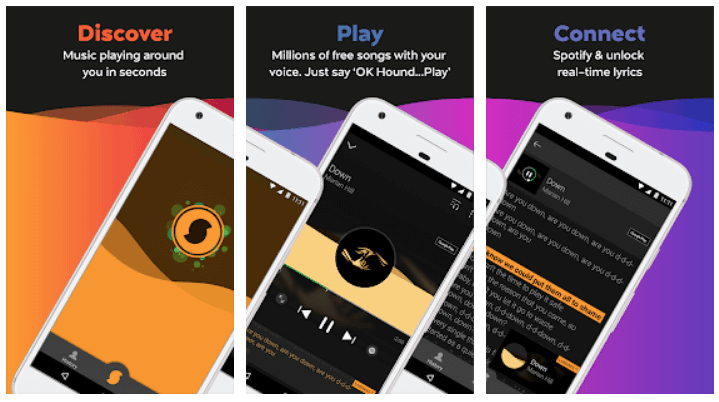 SoundHound is another powerful app which readily can recognize music from anywhere with just one tap. If you are too lazy to tap that button, No Problem! It has built-in voice search where you can search your song by waking it up by saying “OK HOUND!” and then you command line. For Example, If I say “OK Hound! Play Baby by JB” it will start searching the song in its library and plays it. This app also supports Spotify Integration which helps in playing the song again. Don’t have enough bucks to buy Spotify? Then, Here we have Spotify premium for you or else you can choose YouTube player to hear the song again. SoundHound also supports synchronization. It means you can carry your songs on any device by just logging into it. For that, you need to register on SoundHound and enable Sync on your primary device. Also, You can share the music on social media like facebook, twitter, and Reddit. Don’t want to waste your internal memory by installing an additional app to identify music? Then, You can use Google Assistant, which is an inbuilt virtual assistant helps you at your hard times. So, Do you want to know how to use it for recognizing music?? Hold your home button or else call it by saying the command “OK GOOGLE.” Now, you can ask it, What you need. So, For example, I want to know which is the song is this, So, What I will do is? I will ask “What Song is this” and take my phone near to music. It will identify the music and shows the brief history of the song with the link. 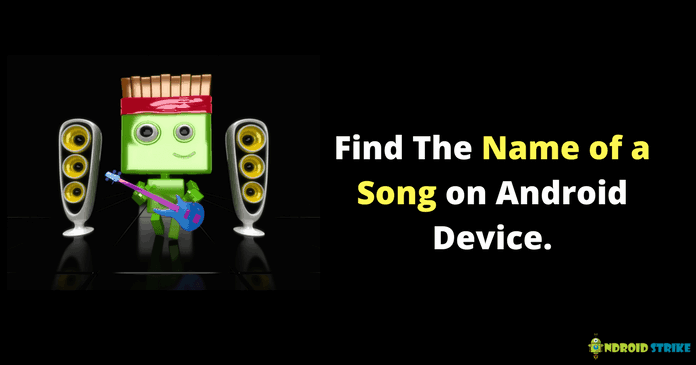 I hope you now understood how to find the name of a song on your Android device. There are tons of other apps are there on the Play Store to find songs but, these are very popular and used by other users to find tunes on the go. However, If you have any doubts then drop a comment below. Also, Don’t forget to share this article with your friends. Next article[Fixed] Unfortunately, How to Fix Google Play Services Has Stopped Error?